Turkmenbashi World of Fairytales, a colossal Disney-esque theme park in the city centre. Mammoth solid gold statue of ex-President Niyazov. Ever since memorising the majority of the world’s flags as a school kid I’d prided myself in having a respectable understanding of world geography. But before planning a trip to central Asia I’d never even heard of Turkmenistan. I scoured the internet and began to anticipate a trip to somewhere slightly different from the rest. This is confirmed in the minibus from the border. Crammed alongside me are 20 women in ebullient floral dresses carrying gallons of yoghurt and jam. They’ve been released from behind the iron bars of a heavily guarded government building and whoop ecstatically to each other. Entering Ashagabat, the capital, I’m initially blinded by marble. Everywhere, everything, is new and polished and pristine and white. No building appears more than 10 years old and armies of workers buff up the exterior, prune the parks, and shine the streets. Then my first glimpse of another colour: gold. Mammoth solid gold statues of ex-President Niyazov mark the entrances to parks and government buildings. He has been quoted as saying he never wanted to build the statues of himself but he had to because the people loved him so much, and it’s almost impossible to turn a corner and not see his fat head. 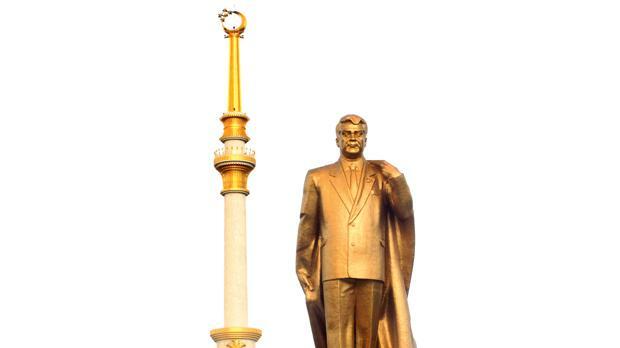 When the Soviet Union broke up, Socialist leader Niyazov simply took charge of the now independent country and led as president for 15 years, changing his name to Turkmenbashi (meaning ‘Leader of Turkmen’), and renaming cities and streets after himself. Fortifying his power, he banned all opposition political parties and held elections where he was the only candidate. Breaking away from Moscow, Niyazov plundered the profits from the nations huge gas and oil reserves and rebuilt the capital city to represent a golden era. It looks and feels like a city created by a computer game; the sort of place a 12-year-old would fashion on Sim City after entering the cheat that provides unlimited money. My homestay provides a remarkable juxtaposition. In Ashgabat’s centre a handful of early 20th century buildings remain. A single-story five-room brick building with a rusting tin roof sleeps 20 or so members of the Dowranov family. It’s an extraordinarily welcoming place but I doubt its legality (not in the guidebooks, a fellow traveler passed me the address on a scruffy piece of paper in a scene that resembled something from The Beach). Towering over their open courtyard is a series of gleaming marble apartment blocks that resemble five-star hotels and will eventually gobble up their more austere home. Turkmen are ethnically tribal people and the brashness and lavishness of Ashgabat doesn’t fit with a culture that hasn’t embraced commercialism or aspiration for commodities. With home-sewn dresses and creased desert faces, the Dowranov’s are content in their more humble abode. 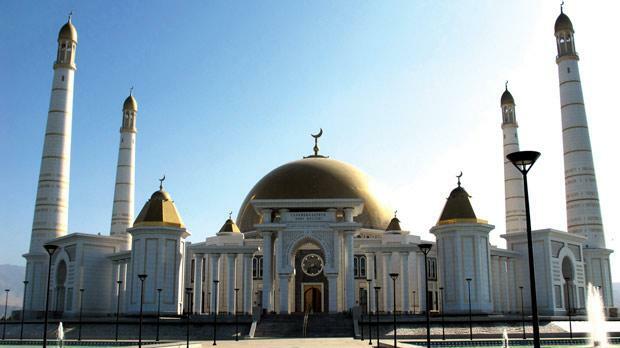 But like everyone I speak to they say that the new Ashgabat is nice. I never encounter any dissent. Niyazov was shrewd and implemented both carrot and stick. He made gas, electricity and water free to the whole country, but bugged hotel rooms and public places and maintained a network of informers who ensured that anyone speaking against the regime was incarcerated. But surely some people are dissatisfied with the crazy law changes? Buoyed by his perceived popularity, Niyazov’s personal whims started to dictate the country’s laws. He made smoking on the street illegal after being forced to quit himself for health reasons, outlawed opera, ballet and dogs because he didn’t like them, shut all hospitals outside the capital, and closed the country’s libraries with the rationale that the only books Turkmen should read are the Quran and his own. Then he went outlandishly beyond eccentricity. In his later years he renamed the months of the year after members of his family and ordered an entire town to be demolished and deleted from all maps because it didn’t fit with the lofty ambitions of his golden era. Wandering the deserted streets I spot the unguarded entrance to a marble apartment. Intrigued, I enter and take a lift to the 12fth floor for immense views over the computer city. A caretaker finds me. Pointing aggressively and shouting “police…militia” I immediately realise that he suspects me of being a spy. Retreating quickly I’m chased out and I switch memory cards to hide the snaps of the Presidential Palace. The Turkmen government insists that foreigners must be accompanied by a government guide to visit the country. However, under pressure from neighbouring countries to keep open trade routes, a five-day transit visa can be obtained. But with a transit visa I should be moving, not spending three days in the city, and I’m aware that any check on my passport by any of the police that man each street corner is likely to lead to deportation. Photographing the palace and parliament buildings is a more severe crime. Epic gold and turquoise domes, gigantic marble pillars, polished street lights, bronzed walls I can see my reflection in: these building exemplify the indulgence and unsurpassed opulence of Niyazov. Simply standing near them with a camera will get you arrested, I’m told. The incident intensifies my paranoia. Every guard watches me, every approaching car sounds like a police van, and the camera stays in my pocket. How do I know they’re watching me? Because I’m the only person on the street. Where are all the people? Not in the three-kilometre long Independence Park that contains a 10-metre high golden statue of Niyazov’s book Ruhnama; nor by the largest fountain in the world; or in the 30,000-plus capacity fake Olympic stadium. 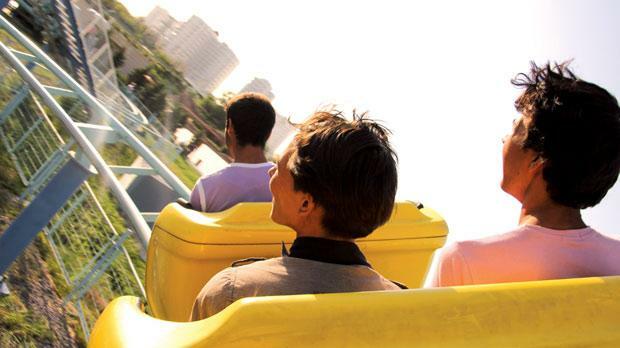 But I do spot 20 or so locals on a Friday evening in the Turkmenbashi World of Fairytales, a colossal Disney-esque theme park in the city centre with log flumes, rollercoasters and men dressed as cartoon characters. Without people, the immaculacy of the unblemished city produces an inescapable sterileness that even the vibrancy of the Dowranov’s five daughters and their flamboyant hip clinging dresses can’t interrupt. Suddenly, a blemish on the horizon. A vast ball of smoke drifts across the dry desert sky, blocking the 50˚ sun for over an hour. An electricity plant blew up 25 kilometres away but no one was hurt reports the radio. However, since leaving Turkmenistan I discover that it was an arms base that exploded, the whole town of Abadan was destroyed and, according to some reports, “dead bodies were strewn across the streets.” Most international media sources put the number of dead at above 1,000. Reporters Without Borders ranked Turkmenistan as the second worst country in the world (after North Korea) for media freedom. Eventually I do transit and crossing the desert I get an alternative view of the country. Most villages appear somewhat dilapidated and there is a pervasive sense of poverty along the horrifically potholed main road that connects the east and west of the country. While eternal resources have been pumped into Ashgabat the rest of Turkmenistan appears overlooked and disregarded. Flamboyance, extravagance, and comical indulgence; on the one hand Turkmenistan is the most interesting country to ever possibly visit. It’s not one I would ever visit again, but the paranoia and inescapably visible oppression are worth it even for that first glimpse of the marble world. But on the other hand, people’s lives are not a computer game. Without a higher profile among the world’s population, and international pressure, Turkmenistan is sure to continue as the craziest country in the world.